Here’s an easy Christmas craft that makes a lovely gift for kids to make for their teacher, mom, grandparents or friends. It’s a great recycling craft too, reusing a tin can as the base. 1. Place a strong rubber band around the tin can, approximately half way down from the top. 2. Begin inserting wrapped candy canes into the rubber band so the hooked part of the cane faces outward. As you proceed around the can, you might find that the candy canes tend to fall to one side. Just keep straightening them as you work – once the last candy cane is in place, you should find that the candy canes will stay upright on their own. If not, add another rubber band, fairly close to the first one, to keep everything in place. 3. Tie a wire-edged ribbon over the rubber band and make a nice bow. If you like, you can cut the ends of the ribbon on a slant, or in a vee shape, for a nice touch. 4. 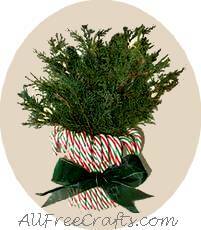 Add sprigs of fresh evergreen trimmings to the tin can and your Christmas candy cane vane is complete.